Bei einer TV-Show wie „Breaking Bad“ sollte man nicht live-twittern, so Salon.com-Autor Jenn Gidman. Man würde so seine soziale Empathie gegenüber der Hauptfigur verlieren. Spoiler Alert – wer noch nicht Breaking Bad gesehen hat, sollte nicht auf den Original-Link klicken. Aber diesen Artikel lesen. However, in keeping with much of the research on multitasking in general, you might not be as engaged as you should be if you want to get anything meaningful out of either your Twitter feed or your favorite TV show. A Stanford study shows that “chronic media multitaskers” perform poorly on task-switching because they’re distracted by their multiple media streams. When their eyes are darting back and forth between their TV screens and their Twitter feeds, they may be “sacrificing performance on the primary task” — in this case, their undivided attention to Walt, Jesse and the rest of the motley New Mexican crew. Complete engagement isn’t usually necessary with these forms of electronic escapism. Watching TV is a passive endeavor to begin with […]. But a show like “Breaking Bad” — baby, you’re different than the rest. You might share “moments” with characters on the other shows you watch. 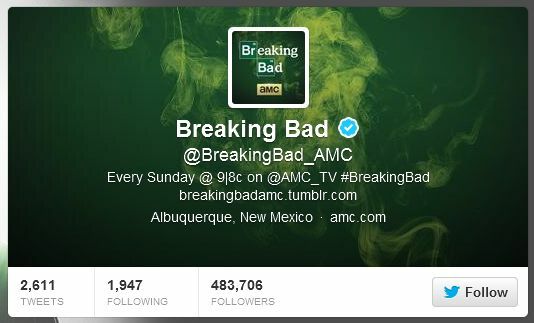 But with “Breaking Bad,” you know that you are just as much the danger as Walter White. You feel it. To undergo this rather inexpensive self-examination, you don’t want to be spending those critical 60 minutes trying to think up really awful “Breaking Bad” alternatives or clever names for the #BreakingBadBands hashtag. The recent Nielsen/SocialGuide study confirmed that increases in Twitter volume correlate to increases in TV ratings for varying age groups, revealing a stronger correlation for younger audiences. Specifically, the study found that for 18-34 year olds, an 8.5% increase in Twitter volume corresponds to a 1% increase in TV ratings for premiere episodes, and a 4.2% increase in Twitter volume corresponds with a 1% increase in ratings for midseason episodes. Additionally, a 14.0% increase in Twitter volume is associated with a 1% increase in TV program ratings for 35-49 year olds, reflecting a stronger relationship between Twitter and TV for younger audiences. Results showed that heavy media multitaskers are more susceptible to interference from irrelevant environmental stimuli and from irrelevant representations in memory. This led to the surprising result that heavy media multitaskers performed worse on a test of task-switching ability, likely due to reduced ability to filter out interference from the irrelevant task set. These results demonstrate that media multitasking, a rapidly growing societal trend, is associated with a distinct approach to fundamental information processing. Wer also sich auf Breaking Bad konzentriert, tut damit auch etwas für seine Konzentrationsfähigkeit bei anderen Tätigkeiten. Manchmal kann Enthaltsamkeit von Social TV also auch gut sein. 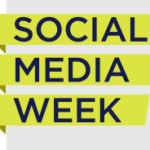 Über diese und weitere Nachteile der Nutzung von sozialen Netzwerken werde ich bei der Social Media Week reden. Sagt Schwarmintelligenz das Ergebnis der Bundestagswahl voraus?